Landarzt Dr. Robert Koch ist verzweifelt: Eine Tuberkulose-Epidemie rafft die Kinder seines Bezirks dahin, ohne dass man etwas dagegen tun könnte. Jedes vierte Kind ist bereits erkrankt, hilflos müssen die Eltern zusehen, wie ihre Kleinen sterben ... Nun unternimmt Koch, der sich bereits seit Jahren damit beschäftigt, den Erreger der Tuberkulose zu finden, noch größere Anstrengungen, um der Ursache der Seuche auf die Spur zu kommen. Erschwert wird seine Arbeit durch Neider, wie etwa einen in seiner Ehre gekränkten Lehrer. Das größte Hindernis jedoch ist der berühmte Berliner Wissenschaftler und Reichstagsabgeordnete Geheimrat Rudolf Virchow: Er steht Kochs Theorie, dass ein Bazillus der Auslöser der Tuberkulose ist, äußerst skeptisch gegenüber. Country Dr. Robert Koch is desperate: a tuberculosis epidemic is decimating the children in his district and no one is able to do anything about it. Every fourth child is already sick and the parents must helplessly watch as their young ones die. Now Koch is undertaking to find the cause of the tuberculosis --- something he has already been working on for years --- which has been causing this plague of illness. His work is made more difficult by envy; for example, that of his teacher, who was wounded defending his honor. But his greatest obstacle is the famous Berliner scientist and Reichstag deputy, Privy Councilor Rudolf Virchow: He is extraordinarily skeptical of Koch's theory, that the cause for tuberculosis is a bacteria. DVD-R IS IN GERMAN WITH SWITCHABLE ENGLISH SUBTITLES. APPROX. 109 MINS. + 15 MIN. NEWSREEL. EXCELLENT FILM QUALITY OVERALL. One genre of Third Reich cinema was known as 'The Genius Film.' The protagonist was a deceased famous scientist, artist, composer, politician. businessman, philosopher, or military leader who defied the norms of society and sometimes paid for his actions with his life. Their noble stories feature a dedicated follower who usually dies supporting his idealized hero. These films were set in the not-so-distant past while biographical and historical facts were frequently changed or omitted to reflect National Socialist ideals. The main characters whose names were usually displayed in the titles were depicted as rebels who persevered their way to the top and/or later hit bottom but never abandoned their principles, sometimes at the cost of losing family, position, and material comforts. In the end, some may have not succeeded, but their efforts were an inspiration for others to carry on their work that eventually benefited future generations. Propaganda was cloaked by entertainment as audiences were supposed to identify with these struggling characters as the historical prototypes of Hitler whose autobiography 'Mein Kampf' coincidently translates as 'My Struggle.' The best known examples are the films about the wise and benevolent Frederick the Great, the most famous being 1942's DER GROSSE KONIG (THE GREAT KING) as Hitler wished he was seen by his nation. anger just about everyone in town - the superstitious peasants, the Christian Scientists whose church brands him as the "living Satan" and the schoolteacher who rejects his advice about opening classroom windows to let in fresh air and sunshine to prevent illness - except for his biggest supporter, a judge whose son becomes his loyal assistant who refers to him as a "genius." After an amusing scene where Koch 'cures' a baron's overwrought wife of her "nerves" and insomnia by surprising her with a dousing of cold water, the extremely grateful husband arranges for him to pursue his research at the Board of Health in Berlin. Koch continues to meet opposition from Geheimrat Virchow, the top doctor and his superior played by Werner Krauss, who Koch refers to as "the pope of medicine" and who finally accepts the results of Koch's relentless research. It's a bittersweet victory due to the death of his assistant who infects himself with tuberculosis to aid Koch's research as this event was foreshadowed when Koch previously said how the devoted young man figuratively has "sacrificed his life" attending to his needs. The film ends with Koch extolling his listeners with veiled propaganda: "You young people will understand me when I say that without sacrifice there will be no life and no progress towards a great objective. I know that these great and good ideas will live on in you, in your minds and in your young hearts. When the torch falls from our hands, you will pick it up and carry it forward to a new and more glorious day'' like the young soldiers at the beginning of WWII which began a few weeks before the film's premiere. Because Jannings was a major star, this film was given the first class treatment in every department and was handsomely photographed by Fritz Arno Wagner, a great cameraman from the Weimar Era and who did not leave Nazi Germany. Performances are good and Jannings doesn't overpower the other actors while Krauss holds his own, in contrast, with a sly, understated performance where he uncannily resembles Virchow in photographs. This is another of his performances where he buries himself so deep into a character that you forget the actor unlike Jannings who is very good here but it's still Jannings with some of his trademarks. Gerhard Menzel, who wrote many big-budgeted propaganda films including DAS MADCHEN JOHANNA and 1941's odious anti-Semitic and anti-Polish HEIMKEHR (HOMECOMING), contributed to the script which explains a lot about its propaganda elements. Director Hans Steinhoff knew how to make 'Genius' and propaganda films from helming 1933's HITLERJUNGE QUEX and 1935's DER ALTE UND DER JUNGE KONIG (THE OLD AND THE YOUNG KING) about Frederick the Great's youth with Jannings playing his father and he would again direct Jannings in 1941's OHM KRUGER (UNCLE KRUGER), a big anti-British biopic that caused the Allies to have Jannings banned from filmmaking after the war. When I first watched ROBERT KOCH, I though it was free of propaganda, but research and a second viewing say differently. The film is considered anti-Semitic because the bacteria-causing disease is supposed to be equated with the Jews indirectly mentioned in lines like "Where's the enemy hiding, what's he look like, what weapons do I need to fight him?" A few years earlier when Berlin hosted the 1936 Olympic games, signs forbidding Jews to enter places were removed to show foreigners there was no prejudice and were replaced with ones calling for strict hygiene by avoiding hidden dangers, a coded warning to Germans about consorting with 'filthy' Jews. After seeing the film, Hitler said "I feel like Robert Koch in politics.... I discovered the Jews as the bacillus and ferment in social composition." However, if you don't know this info needed to interpret certain lines this way, you can enjoy the film as a study about a burdened doctor who fought courageously against provincial narrow-minded and uneducated thinkers, and professional jealousy and rivalry along with his frustrated but basically loyal wife whom he tells: "No, you don't understand me because you don't believe in me. Or do you believe in me?" 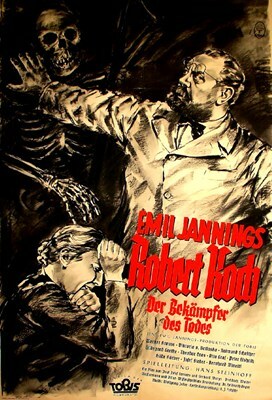 Virchow's un-German name (and Jewish as some critics have suggested, but I see no references in the story) and his opposition to Koch make him the prime enemy in the second half of the film, but you'll see, despite the script's intentions, Virchow is no villain and he redeems himself at the end by settling a misunderstanding between the two scientists, both stubborn and too set in their ways. ROBERT KOCH played in New York City in November 1939 where there was a large German audience. According to Harry Waldman's study 'Nazi Films in America 1933 -1942' the New York Times reviewer said although the film's producers "had put over a bit of Nazi propaganda, the film was nevertheless "serious and entertaining," a fair assessment to me. There were political repercussions when the National Board of Review awarded CONFESSIONS OF A NAZI SPY as Best English-language Film. Waldman continues: "The Nazis objected, letting the State Department know that the Warner Bros. production, which Jewish-born Anatole Litvak directed, was 'poisoning' German-American relations.... To make amends, the National Board selected ROBERT KOCH as one of the best foreign-language films of the year." When a revival was attempted in early 1941 in Los Angeles, it "faced enough opposition that the screening was cancelled. This was a rare victory against the showing of Nazi films in America'" prior to our entry into WWII. Not long after the 1939 film showing, Warner Bros. released DR. EHRLICH'S MAGIC BULLET where Koch is portrayed as supportive of his Jewish colleagues. This DVD has excellent video quality where you can fully appreciate Arno Wagner's visuals and the production design.